take a look at the mail and the calendar of upcoming events. It also appears that the term "rare earth" is sort of a misnomer. Its not so much that those elements in the periodic table are less abundant than those of higher atomic weight, but rather due to those rare earths not congealing into economic deposits of ore like other industrial metals like iron, copper, aluminum, lead and uranium. It turns out right now that China has obtained a very near low cost monopoly on the production of the rare earths, rare earths that are so critical for the production of many modern electronics and magnetic components. When I was working for Big Oil, our company had an operating mine at Mountain Pass, just outside of Las Vegas, which apparently now is closed due to higher operating costs for the world market. There are plenty of chemists and geologists out there that can fill in my very general description of the situation. Hope that sort of explains your question, Richard. This month's calendar of upcoming events is pretty busy too. I will be in San Diego for most of this week at the Energy Storage North America conference. This is one of the last of my dreams that I had hoped would be one of the capstones on my engineering career, so we will see what happens there. I hope to plan for at least one more chance to get another image of Ceres, so to be able to try the "blinking" approach to detecting faint objects. Thanks for the Carnegie update, Math Whiz, Dave. AAS charges a lot for attending their conferences, maybe to keep the amateur crowd, like ourselves out, even though they keep saying they are trying to accommodate the amateurs, who by the way provide a lot of support for real astronomers because our telescopes can be readily made available, without requesting a night of observing months in advance. 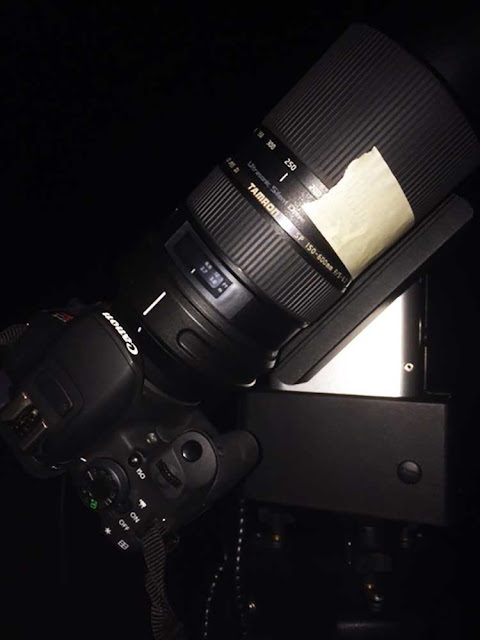 Of course, the types of objects that amateurs can see is often quite limited compared to large scopes, but its sort of hard to beat a worldwide group of interested folks that can point a camera anywhere, anytime. Anyone else up for attending this event? Now lets get back to some of the current events. 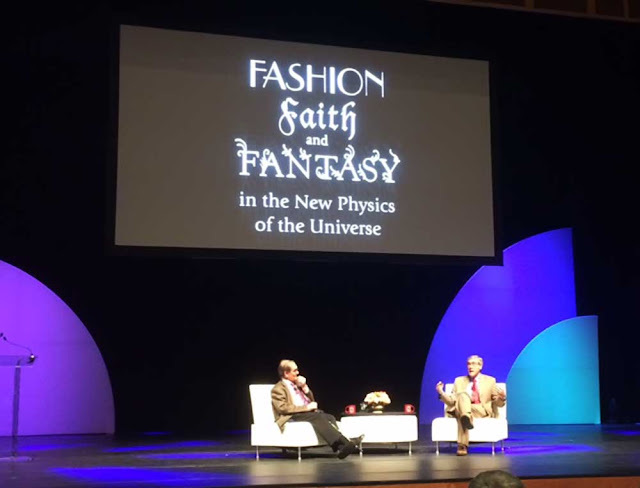 Some of our science squad showed up at Chapman University for the Roger Penrose capstone lecture and other presentations by Paul Davies, Yakir Aharonov, discovered Aharonov-Bohm effect among others, Andrew Brigg, condensed matter physicist s and Werner Herzog, writer and producer of "Cave of Forgotten Dreams", and many others. It was a fun day being on campus. We had quite a good turnout from our OCA Astrophysics SIG and of course our own little posse of science squad members. 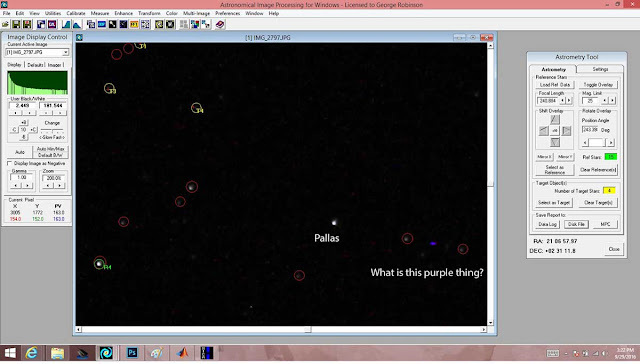 Finally, let's talk about why the asteroid Pallas did not show up (immediately, that is) in the image presented last time. Well, it turned out that my calculation of the predicted sky location was off because I had not updated my Megastar software with the latest minor planets ephemeris. So there you have it, operator error. Now the process of discovering that is a little longer story, which begins when I first went to my goto astronomy expert, Author and OCA Secretary, Bob, who, with his experienced eye detected the missing asteroid. He didn't offer an explanation as to why my calculations were off, but suggested that I could take another image of the same sky location, maybe a day or two later and then overlay the two star images and "blink" the images, first one and then the other, and any slowly moving object, like the missing asteroid, should be able to be detected. Wow, that is a great idea and I agreed that I would try that. Blinking the images is one of the methods used by professional astronomers to find the object that is slightly moving against the fixed star pattern in the sky. Thank you for that suggestion Bob. Now, knowing that Pallas could actually be seen in the image, I rechecked all my position calculations and discovered that my minor planet ephemeris was out of date and when I corrected for that, Hooray!, that darn Pallas was just exactly where it should be. See below. Asteroid Pallas shows up exactly where it should be. But what is that purple object? Now, I still want to try the blinking method, but the sky is just too bright here at Palmia Observatory to get an image of Pallas here. I will have to schedule that for my next time out at the Candy Store observatory. 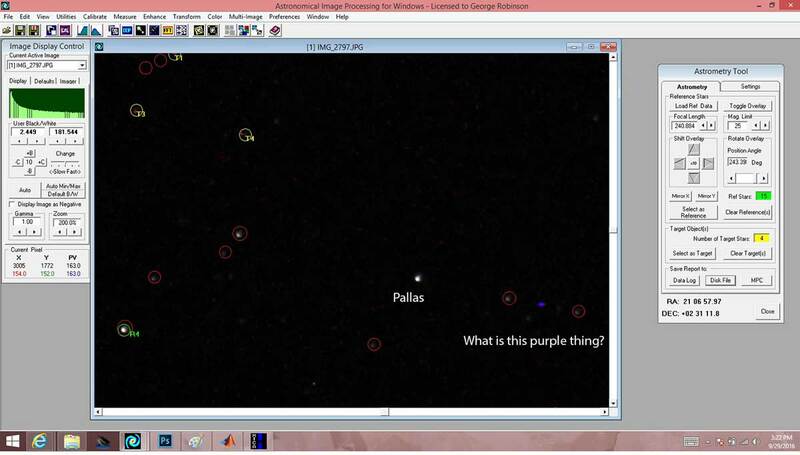 Also, given that Pallas is too dim here, there is no chance that I would be able to see the purple object either, so I sent out a note to other friendly amateurs, including Bob at Altimiri Observatory and Eric at Candy Store Observatory, to see if they could add that object to their observing list. We will see what happens. For sure, I will add it to my observing list when I'm next at the Candy Store. I should say something about the different focal length values that you are maybe beginning to notice. Like, why did I use 240mm or 250mm or even 600m focal length for some images or other. It really doesn't and didn't have anything to do with a need or plan to have a particular focal length other than I set out with the intention to use 600mm focal length setting on all of these images taken with my 150-600mm telephoto lens. I always tried to set the lens to 600mm since this would give images with the widest available aperture and therefore get more light per length of exposure and the size of the target object always fit with that size of focal length. So, yes, I always set off with the intention of setting the lens to 600mm, but I noticed that the lens setting had a tendency to change when the scope was in motion. The focal length of the lens is set by rotating the barrel which causes the length to increase or decrease depending on the direction the barrel is rotated. But when the lens is upright or almost vertical, the weight of the lens causes it to self rotate and the focal length setting slowly and erratically and intermittently begins to decrease and just apparently seemed to stop at about 240-250mm. So, to fix this problem, I now just use a piece of masking tape to keep the lens setting fixed. See below. I can share one other lesson learned about using masking tape to lock the lens in position. You have to remember not to put the tape too close to the focus knurled ring or you will not be able to adjust the focus either. It was quite a shock when I first went to adjust the focus and found that it would not budge even a little bit. Yes, don't put the tape on the focus ring, just the lens focal length adjustment ring. The actual focal length setting is determined during the astrometry phase of analysis, where the background star pattern is compared to actual star catalog positions and that particular angular separation is then attributed to one very specific focal length. So, I might have thought that I set the lens to 600mm, but the astrometric analysis says that the focal length in reality was 580mm, or some such thing. In the meantime, I set up the 600mm lens last night and tried to get a somewhat brighter asteroid, Ceres. This time, I used the correct ephemeris data and predicted right where the asteroid should be. See the 30 second, 580mm exposure below. After a number of reference stars are selected and the catalog stars lined right on top of the image stars, which always takes a bit of juggling and rotating until all the stars line right on top of each other. Now the astrometric position of any other target object can be directly measured and compared to the pre-computed position where the object should be found. So, now consider the expanded view of the image having as a target the asteroid Ceres, magnitude = 7.9, which is much brighter than Pallas at magnitude = 9.5. In turns out, that here at Palmia Observatory, the night sky is so bright with city light pollution, that while I can photograph a magnitude 7.9 object, I cannot see a 9.5 magnitude object other than just a slight smudge, just a little bit brighter than background noise. When this image of Ceres is magnified and shown at 800% normal size, one can immediately see that the object is observed very close to its predicted location on the sky. In the following screenshot, the four red circles are my way of identifying where the target should be found, which is right in the middle with each circle separated from its neighbor by one arc minute. So, we see right away that the prediction matches the observation within one arc minute. See below. 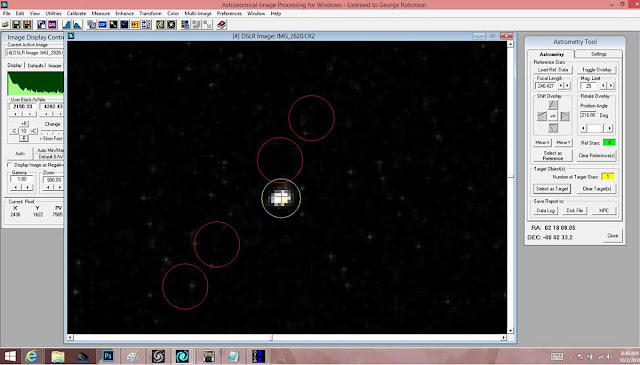 Asteroid Ceres shown next to its predicted location between red circles. I should say one more thing about finding that the planets and minor planets wander about and the ephemeris showing where they are located needs to be updated more frequently than do ephemerae of stars. In researching what the problem was I ran across descriptions of several different types of right ascension and declination. I was reading a 35 page document describing all the differences and it started to make my head spin. One thing that stood out is whether the published RA and Dec include the effects of light travel time. Wow, now they are really trying to get accurate. But this is not as far out as one might assume because this differing light travel time was first proposed by Roemer as a way to measure the speed of light by comparing transits of Jupiter's moon Io, when the Earth is in different locations of its orbit. If you want to read up more on this then check out Author and OCA Secretary, Bob's book, "Astronomical Discoveries You Can Make Too!, Replicating the Work of the Great Observers". He has set out, in projects 26 and 27, how you, too, can repeat Roemer's measurement of the speed of light. In fact, there is a person in OCA, Just a Teenager, Sydney, who we first met during Black Star party, something like on February 22 post, and she was just completing one half of the transit observations necessary to measure the speed of light. Remember that if light takes about 8 minutes to travel from the sun to the Earth, when the Earth is on opposite sides of the sun, the light travel time can differ by twice that or 16 minutes and when this difference in timing is applied to the transit timing diagrams for Io, one can see sort of a phase shift that is proportional to the speed of light. Pretty neat. 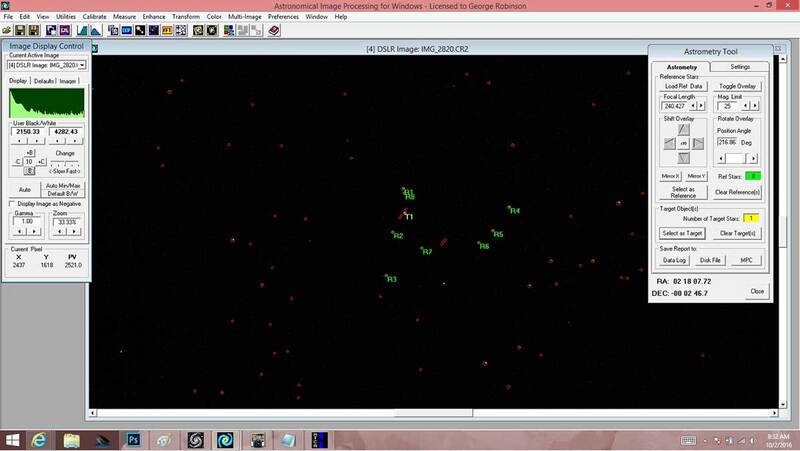 I have not heard yet how the experiment is faring, but I hope for success because it is so neat.